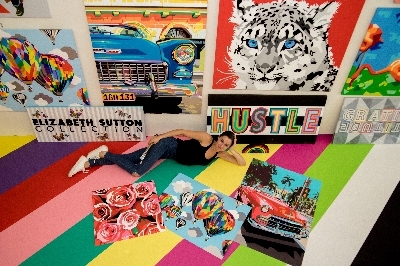 My name is Elizabeth Sutton and I am an artist, designer, and entrepreneur. To give you some background on my career, I began painting 3 years ago and have since grown a loyal following. My art has become coveted by the likes of Kourtney Kardashian, Kendall Jenner, Andrea Boccelli and has garnered the attention of over 23 thousand Instagram followers with engagement rates between 25-45%. My first collaboration with luxury girls accessories line, Bari Lynn accessories, were best sellers at Saks Fifth Avenue, Neiman Marcus, Bergdorf Goodman, Nordstrom's, Harrod's and my second collaboration launches this month. Additionally, for my latest collaboration with international coffee and juice chain, Joe & The Juice, I re-designed the cups. This collaboration launched September 20th in the 17 NYC store locations. Due to the success of this collaboration, I will be working with Joe & The Juice again for Art Basel.